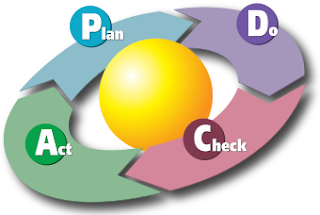 PDCA (plan–do–check–act or plan–do–check–adjust) is an iterative four-step management method used in business for the control and continual improvement of processes and products. It is also known as the Deming circle/cycle/wheel, Shewhart cycle, control circle/cycle, or plan–do–study–act (PDSA). Another version of this PDCA cycle is OPDCA. The added "O" stands for observation or as some versions say "Grasp the current condition." To monitor each work from each lawyer which listed on PDCA check list to ensure the availability status of each job that can support lawyers in completing the work in accordance with the specified time. To coordinate with each lawyer regarding the status of outstanding work to update the PDCA checklist. Analyze and prepare the record sheet of each lawyer that the availability of the performance report of each lawyer. Analyze and ensure the collection of the monthly report of all the company's lawyer submitted to the Chief Legal Officer as a job evaluation. Conducting the process of signature request for legal documents Directorate to ensure every document signed in accordance with the applicable procedures. Ensuring completeness of the data and working documents on file prior to closing for every job that is handled by a lawyer. Organize registration training / seminars and sharing sessions for lawyers to support the improvement of the competence of lawyers. Ensuring filling all documents Know Your Customer (KYC) to be stored properly (hardcopy and softcopy) so that data is easily found if needed. 0 Response to "JOB DESKRIPTION OF PDCA SUPERVISOR"